I’m a very visual person, particularly when it comes to my food. Clearly, since I love to play with my food and take pictures of it. A lot of the time this is a good thing, because I see beautiful photos of food and it keeps me constantly inspired in the kitchen. Sometimes though, it is a bad thing. I’ll see a lovely photo of a dish and get all excited only to find that either there is no accompanying recipe (what?!) or the recipe doesn’t sound as good as the photo looks (bummer). 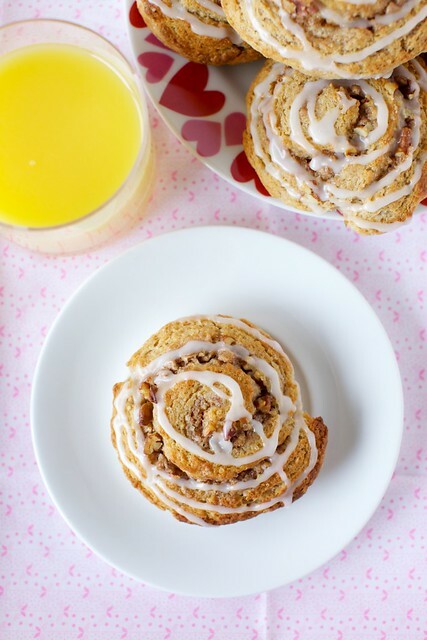 I’d seen pictures of cinnamon roll scones numerous times but none of the recipes sounded worth a shot. I let the idea marinate for, oh, about the past two years and finally I dreamed up with the way I wanted to do them. I started out with the dough from my very favorite scones and subbed in whole wheat flour for part of the all-purpose, as well as greek yogurt in place of the sour cream. Blueberries got the boot for a cinnamon-sugar mixture, toasted pecans and a sprinkling of cinnamon chips. The mixing method for the dough stayed the same but I shaped these differently to achieve the cinnamon roll swirl. As for the final product? Let’s just say my very favorite scones now have a new best friend. As with most scones, these can be prepped in advance and frozen before baking. Bake straight from the freezer for an über simple yet impressive breakfast option. 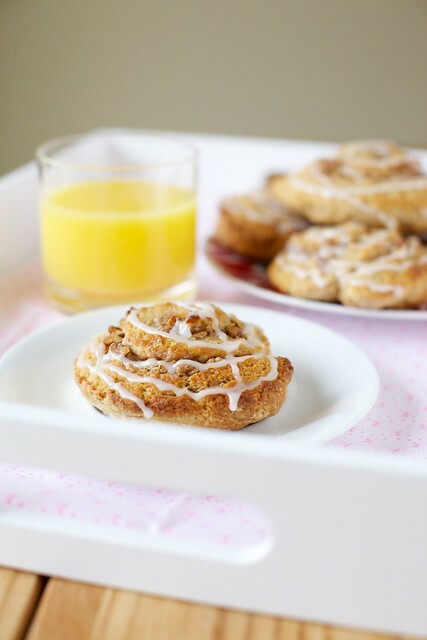 Like, you know, if you wanted to surprise someone you love with breakfast in bed tomorrow? Go for it. Happy Valentine’s Day! Add the milk mixture to the dry ingredients and fold with a spatula just until combined. Transfer the dough to a generously floured work surface. Dust the top of the dough with flour, and knead with well floured hands, 6-8 times, just until the dry ingredients have been mostly incorporated. Bake until the tops and bottoms are golden brown, 16-20 minutes (about 20-22 if baking from the freezer). Transfer to a wire rack and let cool at least 10 minutes. In a small bowl, combine the confectioners’ sugar, vanilla, and milk. Whisk together until smooth, adding additional milk or sugar to reach your preferred consistency. Drizzle the glaze over the scones. Serve warm.